Mar. 10 » Marketing position and sales specialist position available now. Click for details. Dec. 19 » KTM Blackfoot Website UPDATED with GREAT OFFERS!!!!!! Aug. 21 » KTM OFF_ROAD DEMO DAY! Jul. 21 » Kawasaki Mid-Season Demo Day! Aug. 2 » Purchase any new Canadian Kawasaki Motors street bike in August and receive a Kawasaki Eco-Drive watch. While Supplies last. Shop Now! Jul. 22 » Kawasaki Demo Day August 6th, 2016. Jul. 11 » An experience of a lifetime! Triumph North American 2015 Dealer of the Year Award. Jul. 8 » The relaunch of an original. Norton now available at Blackfoot Motosports. Jul. 5 » Triumph Demo Day July 9/16. Your Endless Summer starts now! Jul. 4 » Summer Hours are now in effect. Click for our new hours. Jun. 27 » Szoke completes St-Eustache Mopar CSBK sweep. Jun. 24 » Red Bull Rocks & Logs is this weekend! Canada's first Urban Endurocross returns to Calgary on June 25-26, 2016. Jun. 10 » Good Luck to our Blackfoot Motosports riders Boston Calder, Dominique Daffè , Iain Hopkins and Donovan Mischke this weekend at CMRC Motocross Pro National Series in Nanaimo. We can't wait to see you guys race in Calgary on June 19. Jun. 9 » Italian Brands Demo Day Saturday June 25th. Choose from Moto Guzzi, Aprilia, Vespa, and Piaggio. Jun. 8 » 2016 BMW R1200RT, Starting at $21,250. Accessory credit up to $2000 until June 30th. May. 17 » Yamaha Motorcyle Power Tour. June 14, 2016. Click for more info. May. 5 » 2016 Suzuki Demo Ride Tour. Friday June 3rd. 15 Motorcycles available for demo! May. 4 » Get in the spirit of adventure. Introducing the ultimate touring machine for every road. The V-Strom 1000/SE ABS. Apr. 29 » Kawasaki Demo Day, Thursday May 26, 2016. Come and experience the performance & excitement of the 2016 motorcycle lineup. Apr. 28 » Join us for the KTM Ride Orange Demo Day! May 19 & 20, 2016. Don't miss the chance to experience the 2016 KTM street models! Apr. 27 » BEYOND THE SPORTBIKE The ALL-NEW 2016 GSX-S1000F ABS is a motorcycle built for real-world excitement. Apr. 20 » 2017 Kawasaki Z125 Pro. Early Release! Reserve yours today! Apr. 19 » Download the NEW Triumph 2016 Accessories e-Catalog. Apr. 14 » Limited quantities available in April and May of the early release 2017 Suzuki Canada SV650AL7. Apr. 13 » #ConquerRoad on the all-new aggressively styled Yamaha FZ-10. Now taking deposits for priority delivery. Apr. 8 » Celebrate Spring with Vespa! Up to $400 customer cash on select models. Apr. 5 » Moto Guzzi V9: overview of a masterpiece. Apr. 1 » Triumph Summer Of Adventure. On Now. Mar. 30 » Dainese D-Air Racing Suits. Now Available! Mar. 16 » 2015 Aprilia Caponord - Out The Door Pricing. Only $14,101! Mar. 16 » Cruise On US. Test drive any Triumph Cruiser and receive a $50 voucher to spend in our dealership! Mar. 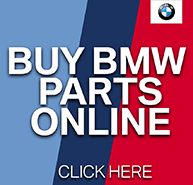 15 » BMW Loyalty Program now on. Mar. 15 » The 2016 Motorcycle Buyer's Guide is complete! Mar. 15 » 2017 KTM Super Duke GT - First Ride Review. Mar. 9 » The Thruxton lineup makes more power than the standard Bonnevilles do. Mar. 8 » New Spring Hours. Effective Monday, March 14th. Open 6 days a week. Mar. 2 » Coming Spring 2016. Promo Jeans. Jeans for motorcyclists. Mar. 2 » Just Arrived! Helstons Motorcycle Clothing. Available exclusivley at Blackfoot. Mar. 2 » Don't forget we sell casual wear too! Jan. 19 » Triumph offering a Special Matte Black Thruxton R. 1 only, Call for more information. Nov. 25 » Happy Holidays from Vespa! $250 Customer cash on select models. Nov. 17 » 2014 Moto Guzzi V7 Racer. Save $2000 + $2000 in accessories! Nov. 17 » 2015 KTM RC 390 New Demo. Limited Quantities. Save $1000! Aug. 19 » Do you Vespa? Free Gas for a year. Aug. 19 » Suzuki DR-70, Out the Door Pricing! $1999.00. Great starter bike. Jul. 23 » Yamaha Summer Power Play. Jul. 17 » Piaggio Scooters Out the Door pricing! May. 13 » Yamaha Generators on sale! Apr. 7 » Timbersled Snow Check Event on Now! Oct. 10 » We pay cash for your clean, pre-owned motorcycle! Sep. 18 » Save $2000 on Yamaha V-Star 950T! Aug. 18 » SAVE $1300 on A2B Electric Bicycles! Jun. 9 » Pre-owned pricing updated! Jun. 9 » Triumph Extra: Value Added Accessories Program extended! May. 21 » 2014 KTM 690 Enduro R ABS available - One left! May. 13 » Save $3300 on a 2012 Suzuki GSX-R600 now $8999! Apr. 22 » One 2014 KTM 350XCF-W Six Days available! Apr. 10 » Triumph Extra: Value Added Accessories Program extended! Mar. 28 » The brand new Yamaha FZ-07 coming soon! Mar. 28 » Save up to $4996 on Piaggio MP3 scooters! Mar. 28 » $1600 off 2013 Kawasaki KLR650! Mar. 28 » MV Agusta F3 675 introductory offer - Save $3000 now only $12,995! Feb. 15 » Save $3800 on a 2012 Triumph Tiger 1050 SE! Feb. 13 » 2014 KTM 1290 Super Duke R coming soon! Feb. 8 » Save $4000 on a 2012 Triumph Thunderbird + $1195 in accessories! Jan. 18 » Sherco trials bikes now available from Blackfoot Motosports! Dec. 19 » Blackfoot Pulse: Holiday Hours of Operation, Gift Ideas and More! Nov. 21 » KTM 1190 Adventure now on display! Nov. 20 » Now taking deposits for the 2014 BMW K1600 GTL Exclusive - Very limited quantities! Nov. 15 » Suzuki King Quad 750 now just $7999 - Save $2200! Nov. 15 » Save $1500 on Suzuki King Quad 500 - now only $7499! Nov. 1 » Now taking deposits for the 2014 BMW R Nine T - Call today! Oct. 17 » 2013 Yamaha WR250F $1500 off now only $6999! Aug. 2 » Check out the August edition of the Blackfoot Pulse! Aug. 1 » Coming soon to Blackfoot, the beautiful, limited edition Vespa 946! Jul. 30 » Please note that we are CLOSED on Monday, August 5th Heritage Day! Have a great long weekend everyone! Jul. 8 » Rescheduled Yamaha Demo Day - Sat July 20 Sign up now! Jun. 27 » New Summer Hours of Operation! Jun. 27 » Please note that we are CLOSED on Canada Day! Have a great long weekend everyone! Jun. 21 » Friday June 21- Blackfoot Closed Early due to the Calgary Flooding Disaster & safety of our patrons and staff in getting here and going home. Thank you for your understanding. Jun. 13 » New at Blackfoot: By appointment One on One Accessory Fit consultations. View poster for details! May. 30 » Blackfoot Certified Service - Now Hiring Mechanic / Technicians. Apply within! May. 15 » Photos: BMW Demo Day! Apr. 1 » Spring is here! Now Hiring, check out out Employment Opportunities! Mar. 27 » CLOSED Good Friday, Friday March 29th! Mar. 12 » The New 2013 BMW R1200GS Has arrived on our Show Room Floor! Feb. 19 » Harlem Shake Blackfoot Motosports Edition! Feb. 15 » Now Hiring: FT Receptionist/Cashier, See details! Jan. 24 » GS Training, Updated Dates and Photos! Jan. 9 » Now Hiring: Detailer Position, Apply today! Jan. 3 » Bike Show Floor Map! Find us at Booths A24 & A16! Jan. 3 » Meet Brett McCormick, World Superbike Racer & 2011 Canadian Superbike Champ at the Blackfoot Booth, Click for Details! Dec. 12 » Save yourself from the line-up and Save $2! Pre-purchase your Calgary Motorcycle Show tickets at Blackfoot for $12! Nov. 1 » The return of the 636! 2013 Ninja ZX-6R has arrived! Nov. 1 » Here's the 2013 Kawasaki Ninja 300 with ABS in the special edition ebony / metallic moondust gray colour! Oct. 30 » 2012 BMW Corporate demos available Now! Call our BMW team for pricing! Oct. 30 » Blackfoot Certified Service receives the Suzuki 2012 Outstanding Service Recognition award! Thanks Suzuki! Oct. 24 » Blackfoot Service: Fall Special: Free Pick-up and delivery Now until Nov! Oct. 19 » Screw-In Carbide Studs: Screw-in studs increase traction in your tires, trucks & footwear. For use on trails, ice, snow or mud! Come check them out today! Oct. 18 » The All New 2013 Kawasaki Ninja 300's have rolled in! Special Ed. Green/Black and All Black currently on the sales floor! Oct. 17 » Win one of our new Keytags on our Facebook page! Sep. 7 » Blackfoot Pulse Newsletter: Same day Service, New Online Features! Aug. 31 » Please note, we will be CLOSED for Labour Day Monday, September 3rd for the Long Weekend! Aug. 14 » BMW Nelson Ride - Street Group Photos! Aug. 9 » Our Phone Lines are Back Up and Running. Thank you for your patience and understanding. Aug. 3 » Please note, we will be CLOSED for Hertiage Day, Monday August 6th long weekend! Aug. 1 » Video: Klipper's Son burns Rubber on the Kids Electric OSET bike! Jul. 19 » ABS Standard on all 2013 BMW models! Jul. 9 » New 2013 Troy Lee Designs Vented Gear arriving daily! Jul. 6 » Blackfoot BMW DEMO DAY, August 2nd 2012 - Info and how to register! Jun. 7 » Photo: Nice Moves, Blackfoot's Adam Kerr and Cody Littau! May. 30 » SIDEWALK SALE! Every Saturday (weather permitting) - up to 60% off on Non-Current Clothing, Accessories, Parts! May. 28 » Retro Meets Modern! JT Racing USA MX Apparel now in-stock! May. 25 » Photos: Yamaha Motor Co. Worldwide President Visits Blackfoot Motosports! May. 24 » Photos: Triumph's Suckerpunch Sally Thunderbird visits Blackfoot! May. 15 » Congratulations Elaine Eissfeldt! Winner of our $250 Gift Certificate Raffle draw from the Calgary Woman's Show! May. 8 » Blackfoot Certified Service, CSR and Technician Employment Positions available! Apr. 25 » Photos: KTM Demo Day! Thanks to all who participated and to our great staff for their hard work! Apr. 18 » 2012 GS Training Dates Announced! Apr. 3 » BMW DEMO DAY, May 11th 2012 - Info and how to register! Mar. 23 » Blackfoot Pulse: Extended Hours of Operation, Reids Auction info and What's new in-store! Mar. 12 » Video: Jeff and his son's first day out with their new OSET electric kids trials bike! Mar. 3 » Blackfoot Pulse- New Store Hours of Operation, Welcome back some familiar faces! Feb. 25 » Enter to win a free Blackfoot Motorsports Hat & T-shirt! "Like" our latest status to enter the random draw! Feb. 21 » Blackfoot Motosports is BBB Accredited. Click to view our online Business Review page. Feb. 15 » Blackfoot Certified Service Department - Re-opened and Refreshed! Feb. 11 » Photo: Great Work Jacine! Thanks for your positive attitude and hard work. Jan. 25 » New 2012 Troy Lee Designs MX Gear in-stock!! Jan. 24 » Special Mounted Signed Jersey Gift from Yamaha - Now on Display above the Cashier Center! Jan. 5 » Clayton Bellamy will be at the Calgary Motorcycle Show Jan 6,7,8 in the Triumph booth...drop by and say hi! Dec. 10 » Fits under the tree! In-stock, Yamaha and KTM Childrens Strider bikes! Dec. 7 » Check out our Holiday Shopping Specials! Nov. 16 » Photo: Check out a great find from Doug's Office! A signed Blair Morgan Poster! Nov. 9 » Please note we will be CLOSED this Friday for Remembrance Day. Oct. 21 » Newly Updated Pre-Owned section! 120 new bikes/quads! Sep. 29 » *Tuesday is the New Monday! * Just a reminder that we are going to be closed SUN & MON for the Fall/Winter season starting in October! Sep. 21 » Save up to $3400 on Kawasaki ATVs & Side by Sides! Sep. 15 » Get the Suzuki 2012 Vstrom650ABS iPhone/Android App! Sep. 1 » We will be CLOSED on Mon, Sept 5 for the the Labour Day Holiday, Re-opening Tues 9am! Aug. 24 » Sherri Jo Wilkins visits Blackfoot Motosports! Aug. 23 » Dainese Factory Authorized SALE! 20-40% off until Aug 31! Aug. 12 » New! 2011 Aprilia SR50 R Scooters! 49cc Factory version also available! Aug. 5 » Summer Savings with all Yamaha and Kawasaki products, check em' out! Aug. 2 » Kawasaki KRF750SBFA Teryx SAVE $3400! Aug. 2 » Kawasaki KRF750PBF Teryx SAVE $3300! Jul. 26 » Dainese Giant Factory Authorized SALE! Rare chance to purchase non-current items at 20-40% off! Limited Time Now till Aug 13, 2011. Jul. 22 » Save up to $1500 on our last two 2011 Kawasaki Jet Ski's! Jul. 20 » A2B Metro Electric Bike - Available for Demo Daily for the next 2 weeks! Come take it for a spin! Jul. 13 » Blackfoot Service now offering: Ride On, Tire protection system. Jul. 8 » Insane Summer Savings! Yamaha Watercraft & Vespa Scooters, save up to $7888! Jul. 7 » Paint the hill ORANGE! 2012 KTM SX in-stock, all models coming soon. Call for pricing. Jun. 30 » Blackfoot Motosports sponsors BMW Superbike rider Brett McCormick! Jun. 28 » Blackfoot Motorrad Nelson Ride 2011 - Sign up today! Jun. 17 » Shorai Motorcycle Batteries now available in Parts! Jun. 16 » Photos: Yamaha Demo Day 2011 at Blackfoot Motorsports! Jun. 15 » TODAY: Yamaha Power Tour Visits Blackfoot! Drop by to demo 2011 motorcycles! Jun. 3 » Team Yamaha Blackfoot Redbull Racing Bikes - Only a few Left! Check em' out! Jun. 1 » Starting this Saturday - Come check out our Sidewalk Accessory Sale! May. 30 » Newly updated Current Events Calender! Keep up to date with upcoming rides, demos and events. May. 13 » Check out our Triumph feature in today's Calgary Sun. Powerful offers on our high performance bikes. May. 6 » Travel with High Fuel Effecientcy! We have a huge variety of Vespa, Piaggio, Aprilia Scooters! May. 5 » THIS SUNDAY! KTM Ride Orange MX Tour 2011. Last chance to sign up! Apr. 29 » Spring Roll-out - Check out this week's SALES flyer! Apr. 26 » BMW Demo Day, Sat May 7, 2011. Just added 3 extra demo units! Check it out. Apr. 19 » Please note that we will be CLOSED on GOOD FRIDAY (April 22) this week, returning Saturday 9-5! Apr. 19 » GS Training - May 2, May 16 2011 - Join us! Apr. 14 » KTM Ride Orange - MX Tour 2011 - MAY 8, 2011, Wild Rose MX Calgary, RSVP: Trevor Unger! Apr. 5 » At Blackfoot Motorsports, every new sport bike purchase receives a 50% off BGPR track school training certificate! Apr. 1 » *only 1* KTM 350 SXF, Tony Cairoli Special Ed. Apr. 1 » Only Two Days Left! Massive Liqudation - Check out the bikes & More in-store. Sale ends April 2! Mar. 22 » Kawasaki Teryx Side by Side on Sale Now!! Mar. 21 » We're donating $50 from every purchase of any New Japanese Motorcycle or ATV from now till the end of March. See poster for details. Mar. 11 » Blackfoot Pulse: What's New In-store! Mar. 11 » New: Spring / Summer Hours of Operation! Feb. 19 » 1 Only "2010 30TH Anniversary R1200GS"
Jan. 10 » Check out Blackfoot Certified Pre-Owned with 238 listings! Jan. 3 » We are back to regular hours! Happy 2011! Dec. 11 » Holiday Shopping? Accessory In-store Wish List for the Rider with "everything"
Nov. 15 » View the Fully Accessorized Grizzly 700 in-store! Customize your own ATV today! Nov. 12 » Come view our huge selection of pre-owned bikes in our second level showroom! Oct. 21 » Four Wheelin' Deals - Check out our great selection! Oct. 5 » Price Reduced! Featherlite Trailer & Peterbilt Tractor $199,000! Aug. 11 » Piaggio MP3 250 save $3500! Jul. 28 » Piaggio MP3 500 and 250 available for test ride! Jul. 26 » Ultra Motor Portia Electric Bike NOW $499! Jun. 28 » Yamaha R1 Now Only $8999. Jun. 16 » SAVE $4550 on 09 Kawasaki ZX600R only $7999...UNBELIEVABLE DEAL! Jun. 14 » 2011 Yamaha Trail TTR250/125/110/50-PW50...Click here!!! Jun. 14 » 2011 Yamaha Raptor 125 All New Model....View here!!! Jun. 14 » 2011 Yamaha Kodiak 450 Now with EPS....Click here!! Jun. 14 » 2011 Yamaha FZ8 Just Launched.....Check it out!!!! Jun. 14 » 2011 Yamaha Fazer 8 Just Released...Check it out!!!! May. 28 » Save $3050 on a Yamaha Kodiak 450! May. 5 » Moto Guzzi V7 Cafe Classic Arriving any Day...One Only!! May. 5 » Suzuki DR650 Dual Purpose Only $4999.00 Unbelieveable Deal!!! Apr. 14 » You're invited! April 27th-May 1st TRIUMPH THUNDERBIRD NIGHTS! Apr. 1 » APRIL In-Store Accessory Specials!!! Mar. 29 » Add Blackfoot Motosports on Facebook! connect with staff and customers! Mar. 22 » Website Update - Customer Corner in Current Events, Now OPEN! Mar. 19 » Watercraft Savings up to $2800 on Quality Yamaha Wave Runners!!! Mar. 19 » Certified Pre-Owned Motorcycles.....OVER 200 ONLINE NOW!!! Mar. 17 » Service Department Extended Hours! Mar. 11 » Summer Store Hours! Starting March 15th! Mar. 8 » We're Hiring! View All Current Employment Opportunities! Mar. 5 » 20% OFF All T-Shirts in Clothing Booth! Mar. 4 » MARCH In-Store Accessory Specials!!! Mar. 3 » SAVE $5900 on your new Yamaha R-1!!! Mar. 3 » Brand New VZ800 Suzuki Cruisers from $6999!!! Mar. 3 » Start Quading with a NEW Yamaha 350 for only $4999.00!!! Mar. 3 » Top 10 Dirt Bikes........UNBELIEVABLE DEALS!!!! Mar. 3 » Looking for a PRE_OWNED Unit? Over 200 to Choose from ONLINE!!!! Feb. 28 » Spy Magneto Goggles Super Sale for a Limited Time! Feb. 27 » SPORT BIKE MUST HAVE TOP 10 Accessories! Feb. 27 » MX & DIRT BIKE MUST HAVE TOP 10 Accessories! Feb. 27 » CRUISER MUST HAVE TOP 10 Accessories! Feb. 27 » ATV MUST HAVE TOP 10 Accessories! Feb. 27 » ADVENTURE BIKE MUST HAVE TOP 10 Accessories! Feb. 27 » SCOOTER MUST HAVE TOP 5 Accessories! Feb. 12 » 2Moto Racing??? Feb. 10 » Save 20% OFF ICON Gear When you buy a NEW CRUISER!! Feb. 3 » Buy a New Dirt Bike and Save 20% on Fox Gear!! 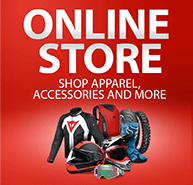 Feb. 3 » Save 20% on Dainese When you Buy a New Sport Bike! Feb. 2 » Yamaha ATV Truck Load Sale On Now!! Jan. 29 » Generators - Waterpumps - Spring Sale! Jan. 29 » Save $2400 on Yamaha WR250XXL Street Legal Bike! Jan. 29 » 148 Preowned Bikes now on our Site!!! Great Selection! Jan. 29 » Check out the UNBELIEVABLE DEALS on Aprilia Bikes.......Limited Availability! Jan. 28 » February Accessory Specials Take a Look!!!!!!!!!!!! Jan. 18 » Over 120 Certified Pre-Owned Now Online!!! Dec. 21 » Save 20% on All Casual Wear till December 31st!!! Dec. 21 » Save up TO 80% on BMW Apparel!!! Nov. 13 » 2010 YZ450F NOW IN STOCK!!! May. 3 » All New Yamaha VMAX on Display Now!! May. 2 » New Yamaha R1 Promo Check It Out Now!! Apr. 17 » Vespa S150 Save $1300.00 Plus No Charge Frt/Pdi/Admin Price Plus Taxes Only!!! Mar. 4 » Save up to $4,600 on a NEW CRUISER! Feb. 26 » Supersport Shootout SALE :: Save up to $5600! Feb. 19 » Down & Dirty Dirt Bike Clearance :: Save up to $3300! Feb. 10 » Blackfoot Wild West ATV Sale! Save up to $2,900!!! Dec. 24 » 2010 Triumph Thunderbird :: Now Taking Orders! Oct. 25 » Take a first look at the NEW Ninja 400! Sep. 13 » SUPER NAKEDS - The Cycle World Naked bike shootout! Sep. 22 » Motorcyclist Declares Triumph Street Twin 2016 Motorcyle of the Year! Sep. 13 » Our 3rd Annual JR Ride is Sunday Sept 18th! Aug. 12 » Triumph Street Twin: Best Standard Motorcycle of the Year Winner. Aug. 10 » Triumph Infor Rocket Streamliner Officially Becomes The Fastest Triumph in History! Aug. 8 » 2017 Moto Guzzi MGX-21 Flying Fortress First Ride Review. Aug. 2 » Guy Martin confirms Triumph speed record attempt at Bonneville. Jul. 27 » The upcoming parallel-twin KTM 800 Duke has been spied testing on the road. Jul. 18 » The longest day: How two Americans conquered Canada in 17 hours on a pair of Triumph Tiger 800s. Jul. 11 » BMW'S F800 GS, F700 GS GET UPDATES FOR 2017. Jun. 27 » Naked Fun On The Yamaha FZ-10. Jun. 24 » MX Nationals ROUND 4 this weekend in Regina! Good Luck to our Blackfoot Riders! Jun. 8 » Watch Michael Dunlop post the fastest lap ever at the Isle Of Man TT race on the BMW Motorrad S1000 RR Superbike. Jun. 6 » The History of Military Motorcycles. Jun. 6 » The 10 Best Buys in Motorcycles for 2016. May. 24 » Vance & Hines Exhaust Sound-Off. Click below to hear the stock Street Twin exhaust versus the Vance & Hines high-level scrambler full exhaust. May. 17 » 2017 KTM Official Model Release: What You Need To Know! May. 17 » EXCellent news! KTM's 2017 Enduro range is here! May. 13 » 2016 KTM Canada Motocross Contingency Program. Apr. 28 » All hail the Aprilia Caponord Rallye. A good street enduro and a full-on Italian adventure bike. Apr. 27 » 2016 BMW National Test Ride. Thursday May 12 & Saturday July 23, 2016. Apr. 27 » 2016 Ultimate Streetfighter Shootout: Irresistible Forces: Aprilia Tuono V4 1100 Factory v KTM 1290 Super Duke R.
Apr. 23 » Happy 70th Birthday Vespa! Apr. 22 » Thank you Kelly, Bryan and Sam for the recent reviews! Apr. 20 » The K 1600 GT: The pure sense of Gran Turismo. Where are you dreaming of going on your next tour? Apr. 14 » Thank you Robin for your patronage and positive review! Apr. 13 » From ''nerdy kid'' to stunt king, @NickApex explains his rise to the top at For The Ride. Apr. 8 » The BMW G310R Versus The World! How does BMW's new little bike stack up to its competitors? Apr. 1 » Take a closer look at this copper plated Bonneville. Mar. 22 » New Triumph Bonneville T120 and T120 Black: Timeless Icons, Beautifully Evolved. Mar. 12 » The $17,000 Superbike Faceoff: Can Kawasaki's new 2016 ZX-10R upset the Aprilia RSV4 RR? Mar. 9 » 3 reasons the KTM 1290 SUPER DUKE GT has the press excited. Mar. 8 » Canadian Kawasaki Motors is happy to announce that the Z125 Pro will be coming to Canada! #Z125. Mar. 5 » New Triumph Tiger Sport announced. Oct. 14 » Introducing the Lewis Hamilton & MV Agusta Dragster RR! Sep. 5 » We will be CLOSED Labour Day, Mon Sept 7, have a great long weekend! Sep. 4 » Video: Canadian Freestyle Motorcycle Riders, Ryan Hawco and Craig Latimer! Aug. 17 » Coolest Video of The Year: Robbie Maddison's "Pipe Dreams"
Jul. 31 » We will be CLOSED Monday August 3, have a great long weekend! Jul. 9 » Updated Customer Reviews! Thanks Eric, Jack, Michael, Robbie, Christopher! May. 27 » Maybe Coming Soon from BMW???? Apr. 18 » Employment Opportunities Updated! Apr. 9 » 2015 Kawasaki H2 now on display! Feb. 14 » 911 Adventure Road Side Repair Course now available! Dec. 3 » Thanks Ride for Dad Calgary for the Continued Support! Oct. 8 » Now Hiring - Blackfoot Direct - Accessories Sales and Marketing / Web Positions! Sep. 18 » Photos from the GS Trophy - held in AB/BC Canada! Sep. 5 » Thank you Kevin, David, Barrett, Jeremy for your recent reviews! Jul. 23 » A big congratulations to Laura MacMillan, the winner of the 2014 Calgary Stampede Lottery truck & toys prize! Jul. 15 » Kevin Munk heads to the Bonneville Salt Flats on his BMW HP4 this August - Join us in supporting his cause! Jul. 4 » Congratulations to our own Bret Hart for his third place finish at the Yamaha 2014 Technician Grand Prix! Jun. 30 » Special Event, Sat July 5, Suzuki 2014 Vstrom 1000 Couple travelling the world, Meet and Greet! Jun. 28 » Video: Check out our Resident Tech, Kris Freestyling! Jun. 21 » Customer Submitted Photo, Ken Thrower in Idaho on his R1200GS! Jun. 19 » To Continue to receive our Email Newsletter, Please Opt-In! Jun. 9 » Suzuki Demo Day - Thurs June 12th, Availability & Schedule Updated! May. 27 » Can you help us find these fraudsters? May. 20 » Yamaha's "Win a Factory Ride" is back! May. 13 » Please note we will be CLOSED Holiday Monday, May 19th, Victoria Day. Enjoy the long weekend! Mar. 29 » 2014 Off-Road Training Course Dates Announced! Mar. 28 » Do u agree? This is the BEST enduro commercial ever!!!! Jan. 25 » Check out the latest edition of our Online Newsletter - The Blackfoot Pulse! Bike Show Prize Winners, Now Hiring & BMW Corporate Demos for Sale! Dec. 5 » Newly updated! We're looking for some great people to join our team for 2014! Nov. 22 » Check out of amazing Vespa 946! Nov. 13 » Thank You Tyson, Rami, Dylan, Doug, Bill, Dave and Brad for the awesome feedback from the past 30 days! Nov. 7 » Check out this awesome video of OSET trials bikes ripping it up! Sep. 24 » Guitar Aficionado mag continues to explore New York City area's music scene aboard a 2013 Street Triple R - Hoboken's Guitar Bar. Sep. 24 » The New York Times says the Castrol Rocket is "a visually stunning 25.5-foot monocoque speed machine, (that) is Triumphâ€™s effort to get back into the land-speed record chase." Sep. 24 » Triumph Tiger Explorer as Stunt Bike? Aug. 26 » It is with great sorrow and heavy hearts to announce the passing of Blackfoot Motosport's own John-Ross MacRae. He will be forever loved and missed by us all. Aug. 14 » Still space available in our upcoming GS Training Courses! Have an Enduro? Bring it out and have a fun day at the MX track! Jul. 17 » In support of the Heart & Stroke Foundation, Kevin Munk will be heading to the Bonneville Salt FLats with his BMW HP4 this August. Jul. 8 » Stolen: Triumph Daytona675 keep an eye out for it. Jul. 3 » The 2013 Trophy SE is one of the top 10 motorcycles that ConsumerReports.org wants to ride this summer. Jun. 13 » 2013 Superbike Shoot out "Best of the Best"
May. 30 » BMW S1000RR Street Fighter!!!! May. 25 » BMW's "NineT" REVEALED!!!! Apr. 18 » 2013 Big Adventure Shoot out "Off Road"
Apr. 16 » Video: Waiting out Winter - A homage to all craftspeople who spend their winters tucked inside their workshops waiting for better weather. Apr. 8 » Save the Date: May 25 2013, Red Bull Rocks & Logs, Wild Rose MX Park, Calgary. Mar. 7 » 2013 BMW GS DRY SUIT!! Feb. 13 » 2013 R1200GS - Best Motorcycle in the Universe - "National Post"
Jan. 31 » Don't ever let the fact that its snowing outside stop you from riding. Sjaak Lucassen hasn't, In fact he plans to ride to the Arctic on his R1. Jan. 30 » Video: James Stewart's GoPro catches The Pileup!! Jan. 28 » Unveiled: the development of the new BMW R 1200 GS. Jan. 22 » 2013 BMW R1200GS VIDEO "ENDURO"
Jan. 22 » 2013 BMW R1200GS VIDEO "DYNAMIC"
Jan. 22 » 2013 BMW HP4 TECHNICAL VIDEO!! Jan. 22 » 2013 BMW R1200GS PROMO VIDEO!! Nov. 28 » Awesome Ninja 636 video. Nov. 21 » Custom builder in Bulgaria has an interesting, leather-clad version of a Speed Triple called Bulldog. Nov. 21 » Triumph America - Bike packs more of a punch than you might think. Nov. 15 » 2013 KTM 1290 Super Duke Video "SICK"
Nov. 6 » HP2 Roadster could be real!!!! Oct. 23 » R.I.P x Marco Simoncell! One year ago today MotoGP lost a legend. Oct. 19 » Are the Next R` and R6 three cylinders? Oct. 17 » Video: Totally cool Trails Riding! Oct. 2 » Yamaha - New 3-cylinder engine based on the "crossplane concept"
Sep. 26 » Click here to view a map of Calgary Downtown motorcycle and scooter parking locations. Sep. 13 » Kawasaki announces the return of the Ninja 636 for 2013! Sep. 13 » Sweet HP4 Launch Video "can you say launch control"
Sep. 12 » Video: Buddy Holly, Ariel Cyclone, 1958 Footage! Sep. 11 » Spy shots "BMW R1200R Roadster"
Aug. 22 » New blog post updated by Brett McCormick - On his road to recovery! Jul. 5 » Quad Squad Urgent call for Volunteers! Jun. 30 » 2013 BMW S1000RR Naked!!! May. 29 » 2012 Triumph America Comparison, A great Cruiser for Women riders too! May. 29 » Video: Jason DiSalvo wins at Infineon a few weeks ago (Latus Motors Racing), last lap! May. 15 » Video: Jack Pine custom Triumph - Super cool! May. 15 » Check out the New Completely redesigned 2013 KTM 85sx! Apr. 9 » Majority of the AMRA Demo Fleet Stolen. A sad day for the AMRA. Mar. 13 » 2012 Triumph Speed Triple R - Glowing Review! Mar. 13 » Congrats! Brett McCormick to ride in World Superbike! Mar. 12 » AMRA & Blackfoot Motosports Present: Checkered Flag Support Program for Kids 6-9 years old! Feb. 25 » Video: Aprilia RSV4 Factory APRC 2012!! Jan. 13 » Ultimate Speed Triple/Icon Short "ENJOY"
Jan. 7 » Blackfoot Pulse, Bike Show Weekend! Dec. 15 » Need Motorcycle Paint/Repair work? Contact Tim Brown of T&S Custom Paint. He's done some really good work for us! Nov. 16 » Ever wondered what it's like to do 1:07 laps around Shubie? Watch this video by Canadian Superbike Champion Brett McCormick to find out! Nov. 10 » Video: Triumph 2012 Speed Triple R! Nov. 9 » Answer our Facebook Poll: What do you ride?? Nov. 8 » 2012 Triumph 1200 "Explorer"
Nov. 8 » 2012 BMW G650GS "Sertao"
Oct. 30 » Steve McQueen Bonny up close! Oct. 26 » Video: 2012 Yamaha WR450F intro. Oct. 25 » The Blackfoot Motosports Team sends our condolences to the Family and Friends of Marco Simoncelli. Rest In Peace. Oct. 25 » Triumph Introduces Three New Motorcycles for 2012! Oct. 25 » 2012 Suzuki V-Strom 650A ABS - Check it out! Available soon. Oct. 19 » 2012 BMW G650GS "Sertao"
Oct. 12 » Photos: 2012 Triumph Rocket Roadster Fully Supercharged goes out the door to a very happy customer! Oct. 4 » Video: KTM FALL DIRT PATROL! Oct. 4 » 2012 BMW G650GS "Sertao"
Sep. 27 » 2012 Yamaha R1 "50th Special Edition Anniversary livery"
Aug. 30 » Forget active suspension, how about an active seat? Aug. 29 » Video: Walton 2011: Yamaha sweeps .. Again! Aug. 15 » Test Riding the 2012 KTM 350SXF! Aug. 4 » First look at KTM 2012 Two stroke MX minicycles! We have these in-stock at Blackfoot Motorsports as well. Aug. 4 » Two Strokes Rule! Jul. 18 » Tallon and Tyler Unger train with Ross Pederson! Jul. 18 » K1600GT/GTL Adaptive headlight in action..
Jul. 11 » Apocalypse Scooter Rally! July 29, 2011. Join the 2-Stroke Revolution! Jun. 21 » Triumph Thunderbird Storm "Best Performance Cruiser"
Jun. 10 » Ride to Work day is June 20th, Free parking TransCanada Tower, see poster for details! May. 17 » Stay Cool, Dry, Comfortable All Day, FunctionShirts from BMW Motorrad. Apr. 8 » Interview with The Unger brothers! Apr. 7 » Congratulations Jeff Bloomfield, Canada's #1 Triumph Top Gunn 2010! Mar. 3 » Photos: BMW S 1000 RR in New York City. Dec. 17 » We are now an exclusive Scott dealer! New 2011 MX Apparel and Protection in-stock! Nov. 16 » Intersted on doing a trip around the world or down to Patagonia? Nov. 9 » 20 Women riders Go Enduro at 2010 International Six Days Event! Oct. 29 » Entire 2011 KTM model line up leaked! Oct. 15 » BlackfootDirect Pulse: Gift cards and great gifts! Oct. 5 » GS off-road Training: OCT. 25, 2010 sign-up now, limited availability! Oct. 5 » Montreal Supercross Photo Report! Sep. 22 » GS off-road Training: SEPT 27, 2010 sign-up now, limited availability! Sep. 8 » GS off-road Training: SEPT 27, 2010 sign-up now, limited availability! Sep. 8 » Video: Welocme to Blackfoot Motorsports! Sep. 2 » Blackfoot Pulse: Check out our current promotions and upcoming events! Aug. 31 » 25% off in-stock select 2010 Dainese Streetwear! Aug. 17 » Yamaha's Stanley Cup! Aug. 11 » CMRC Racing News - Walton, the big show is here! Aug. 10 » BMW Motorrad Nelson Ride 2010! August 27-29, last chance to book! Jul. 27 » BMW Motorrad Nelson Ride 2010! August 27-29, book today! Jul. 21 » NEW Photos from MX Nationals Round 5, Gopher Dunes, Team Yamaha Blackfoot Red Bull Fox Racing! Jul. 20 » Congrats Victor Giese of Airdrie! Who won 4 Ultra Motor A2B electric bicycles (from Blackfoot) as part of the "trucks n toys" Stampede Lottery prize! Jul. 12 » BMW Motorrad Nelson Ride 2010! Jul. 12 » Calgary Police partners with Blackfoot for the Stampede Parade! Jul. 12 » Blackfoot Direct - About & latest items! Jul. 2 » Renthal MXP powers Team Yamaha Red Bull Blackfoot Fox Racing! Jun. 23 » Contest: Win a Yamaha 2010 BWs 50 Scooter! Jun. 19 » Brandons First Race. Superstoked Italian 65cc Rider - Hilarious!!! Jun. 17 » Photos: 40th Anniversary Celebrations! Jun. 17 » Ride a Scooter? Check out the Apocalypse Club Calgary! Jun. 17 » Spy Photos: BMW K1600LT!!! Jun. 16 » Round 3 of Canadian National MX Series this Sunday...Info here!!!! Jun. 16 » Preview of National MX Race in Calgary this weekend! Jun. 12 » MXP Radio Live from Edmonton this weekend...Log on and Listen Live! Jun. 12 » Sign up for Yamaha Test drive....still spots available!! Jun. 11 » Check out the NEW Blackfoot Racing Website!!!!! Jun. 9 » Video: 2011 KTM 350SX-F coming soon to Blackfoot Motorcycle! Jun. 9 » Video: 2011 KTM 450SX-F coming soon to Blackfoot Motorcycle! Jun. 7 » Blackfoot Motosports will be closed at 6pm on Wednesday, June 9th. Sorry for the inconvenience. Jun. 4 » BMW Exclusive Edition for the K1300GT! Jun. 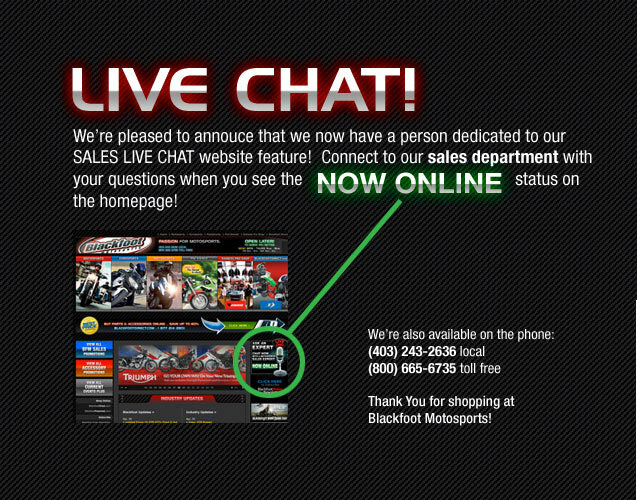 1 » Blackfoot Racing Website - New Look & Latest Updates! May. 31 » Team Yamaha Red Bull Blackfoot Fox Racing - Prepares for round #1 this weekend in Kamloops! May. 20 » Photos Triumph Thunderbird Surprise! May. 17 » Everything you need to know about BMW Motorcycles! May. 13 » Exclusive Opportunity: BMW GS Off-Road Training! May. 12 » BMW Demo Day Photos! May. 10 » First ever WSBK Podium for BMW Motorrad Motorsport! May. 5 » Team Yamaha Photo Shoot in Georgia by James Lissimore..Check it Out!!! May. 5 » Triumph Thunderbird Open House! On Now till Saturday! May. 5 » Photos from An Evening with Rene Cormier! Apr. 30 » Blackfoot Yamaha Photo Shoot J Lissimore Blog!!! Apr. 19 » Video: KTM Braaap! Apr. 15 » In the News: Record breaking sales puts BMW on top! Apr. 14 » Cool A2B Ultra Motor customer photos! Apr. 8 » DMX Podcast with Tyler Medaglia! Apr. 7 » Interview with MX2 Racer Tyler Medaglia - Blackfoot Yamaha Team's New Addition! Apr. 6 » Check Out this Cool Team Yamaha Red Bull Blackfoot Racing Championship Video! Apr. 6 » Our Racer Jolene makes Maxim Magazine with Nitro Circus! Apr. 1 » BMW Motorrad Summerfest 2010 info! Mar. 26 » Brett McCormick Racing in the USA! Mar. 25 » Triumph Dealer Accessories Guides Available for Your Viewing Pleasure! Mar. 19 » Check out our BMW Guru Sales Guy-Jeff Morton's You Tube Videos!!!!!!!!!!! Mar. 19 » Team Yamaha Rider Kyle Beaton Wins Nex Trax Canadian Arena Cross Championship! Mar. 18 » Canadian Superbike Championship Schedule! Mar. 16 » Congrats Jeff Bloomfield! #1 Triumph Sales Canada 2009! Mar. 8 » BMW Motorrad wins Motorcycle of the Year 2010 in all categories in MOTORRAD Magazine! Mar. 5 » BMW S1000RR Group Test Ride Video!! Mar. 4 » Renthal Re-Signs with Yamaha Red Bull Blackfoot Fox Racing! Mar. 3 » Canada wins Gold with Team!!!! Feb. 27 » Team Yamaha Red Bull Blackfoot Racing testing in Georgia and Cheering on Canada!!!!!!!!!!! Feb. 27 » Save up to $1500 on your NEW Suzuki Motorcycle by March 8th!!!! Feb. 27 » Get up to $1500 in Suzuki Bucks when you buy a New Suzuki ATV by March 31st!! Feb. 3 » Facciotti Wins British SX Championship........Check out this Video! Jan. 29 » KTM Announces Sales Program! Jan. 11 » Blair Carries Olympic Torch Tonight!!! Jan. 10 » Stewart WINS Anaheim on New YZ450F Yamaha!!! Dec. 18 » Very Cool New Radd Front Susp. Oct. 31 » Check out Yamaha Canada Face book!!!! Oct. 14 » James Stewart......Incredilble......How does he DO IT!! Aug. 11 » Blackfoot Racing celebrates their tenth anniversary with another MX-1 national championship! Jul. 28 » Facciotti tames the mud of Ste. Thecle and extends championship points lead. Jul. 6 » Thunderbird wins Cycle World's Best Cruiser Award! May. 30 » Xfighters Live Webcast Saturday!!!! May. 20 » BMW "Motorcycle of the Year"
Feb. 20 » Check out the new Aprilia RSV4! Feb. 4 » Check out our NEW 2009 Yamaha Photo Gallery! Jan. 30 » Check out our NEW 2009 Triumph Photo Gallery! Jan. 30 » Come see the 2010 Triumph Thunderbird at Dayton Bike Week! Jan. 28 » Check out Suzuki's RideSmart Microsite! Jan. 06 » Photo Gallery :: Take a look at the Blackfoot Motosports Dealership!